Sofia Airport (IATA: SOF, ICAO: LBSF) (Bulgarian: Летище София, Letishte Sofiya), sometimes also called Sofia-Vrazhdebna Airport (Bulgarian:Летище София-Враждебна, Letishte Sofiya-Vrazhdebna), is the main airport of Bulgaria. 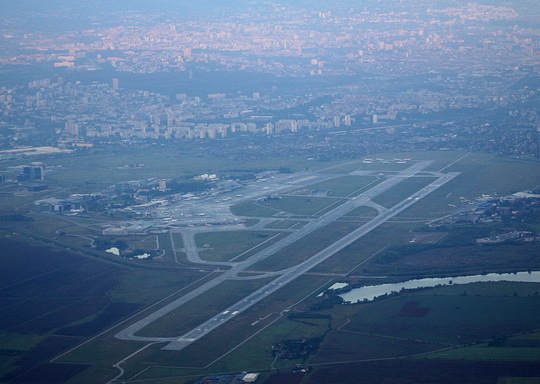 The airport is located 5 km (3.1 mi) east from the centre of Sofia. In 2013, the airport handled 3,504,326 passengers, a 1.1% increase compared to 3,467,455 handled in 2012. Also in Sofia Airport is located the Vrazhdebna Air Base of the Bulgarian Air Force. The airport was initially built in the late 1930s on a site 6.3 km (3.9 mi) (7.5 km (4.7 mi) by road then; later 9 km (5.6 mi) by road and today 10.2 km (6.3 mi) and up to 11.4 km (7.1 mi)) distant from the geographical centre of Sofia as a replacement of that city’s small civil airport at Bozhurishte. The airport was used as hub by domestic airliner Bunavad which connected Sofia to Burgas, Plovdiv, Ruse and Varna. In 1938, Yugoslav airliner Aeroputbegin regular direct flights linking Sofia to Belgrade three times a week using Lockheed Model 10 Electra planes. The airport served Sofia which then had under 250,000 inhabitants and continues to serve the city nowadays, which had about 1.2 million by 2011. During the Second World War, the facilities were used by the military. Mail, perishable freight and passenger operations began in 1947 from buildings on the north side of the airport. The passenger terminal (now Terminal 1) on the south side was completed during the Second World War in the manner of a then-modern European railway terminus to designs by the architect Ivan Marangozov. It opened after several years of delay in 1947. The structure comprised a government wing to the west, an international handling area in the middle, and a domestic handling area to the east. At that time, it was planned that the airport would eventually have two intersecting runways at a 30-degree angle to each other. The terminal had substantially reached its capacity of some 600,000 passengers a year by the later 1960s and was subjected to a number of refurbishments and extensions beginning in the spring of 1968. 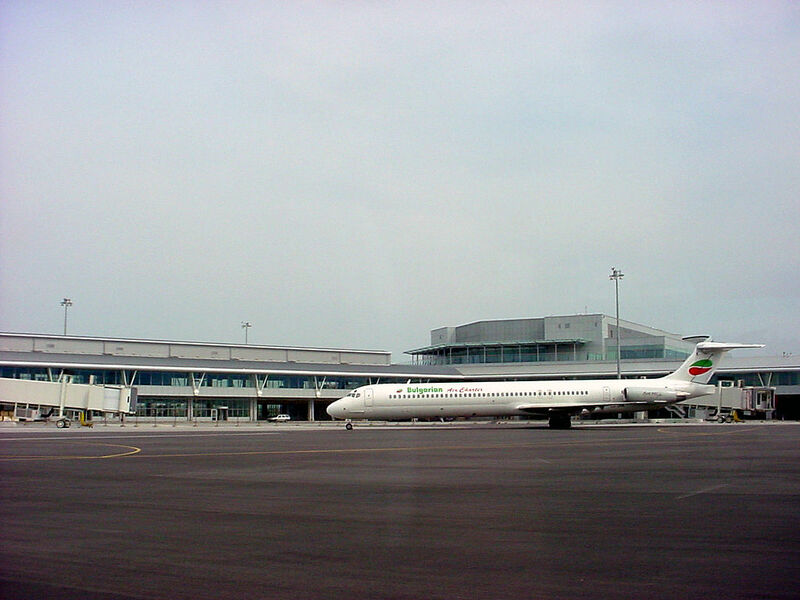 In 1975, a new international arrivals handling extension was opened to the west of the building, the domestic area to the east was enlarged, the government handling area was removed to a dedicated terminal some distance to the west, a VIP handling area opened in the old terminal, apron area was extended to the east and new taxiways opened. A bonded warehouseopened to the east of the terminal square in 1969 and several new hangars followed to the east of the first maintenance base in the 1970s. A new checked baggage handling system opened to the north of the building in the early 1980s, cosmetic and traffic reorganising refurbishments were carried out in 1990, with a substantial landside extension following in 2000. By the late 1970s, the terminal was handling in the region of three million passengers a year, a million of them on domestic routes. Passenger numbers fell off sharply after the 1979 CMEA (“Comecon”) oil price shock and recovered to just over a million a year by the late 1980s. In the early and mid-1990s, domestic traffic practically ceased, while foreign traffic reduced significantly. The latter began growing apace in the late 1990s and early 2000s to reach its current levels. The terminal was last refurbished partially in 1990. 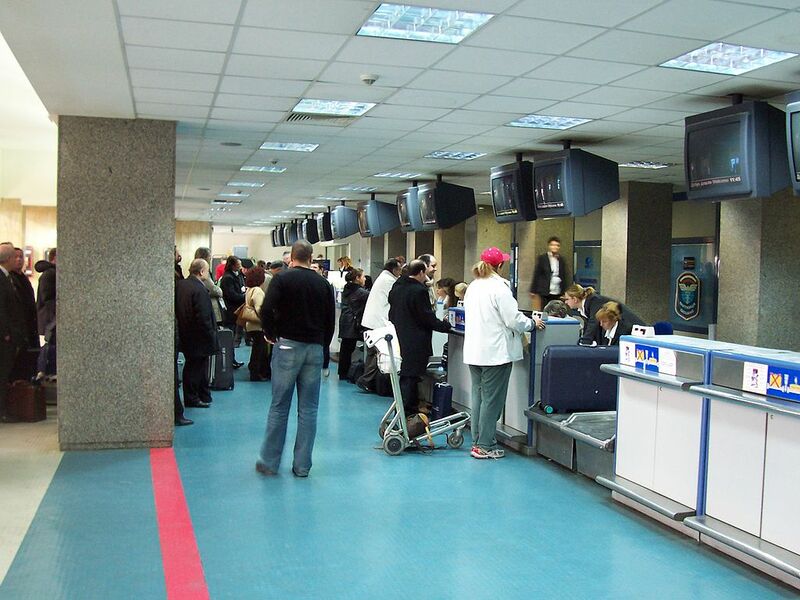 In 2000, it underwent a wholesale update in which the international arrivals area was moved to the east wing where domestic handling had been, the former international arrivals area to the west was closed, and the layout of the central international departures area was changed in line with world developments. Despite the work to the old terminal, the airport was becoming overwhelmed with passenger traffic. Options for different airport developments began to be examined in the mid-1960s. One option was to relocate the facility to a new site, with some locations up to 70 km (43 mi) from Sofia). Another option involved extending the airport’s area radically to the north-east and gradually removing the focus of the airport there. A third option was to develop substantially the same site. By the later 1980s, the authorities had settled on the last option. Project design, involving a new terminal to the east of the old facility, a new runway to the north of (and parallel to) the existing runway, and taxiways, was completed by the mid-1990s. A finance package involving very significant European and Kuwaiti investment was initially agreed in 1998 and was in place by 2000. Work began in 2001. The new runway and some taxiways were completed in mid-2006. Terminal 2 was formally inaugurated on 27 December 2006. Design and construction of a new control tower was discussed in 2006 but this project appeared to be in abeyance by 2008. Over the years, Sofia Airport has been criticised for its lack of world class air freight facilities and for some access problems. 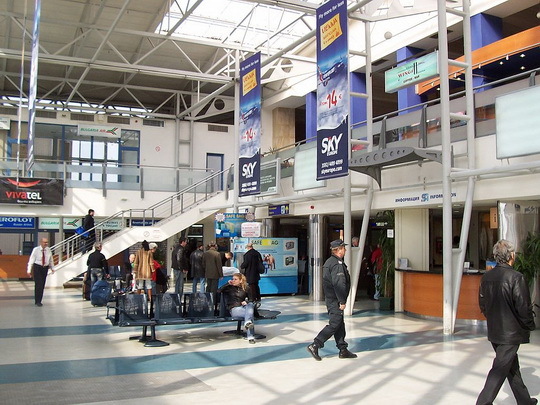 Passengers to and from the Bulgarian interior have to access or egress the airport through crowded rail and coach facilities in central Sofia. A rail link has been discussed on several occasions since the 1960s but no moves have been documented to its implementation. 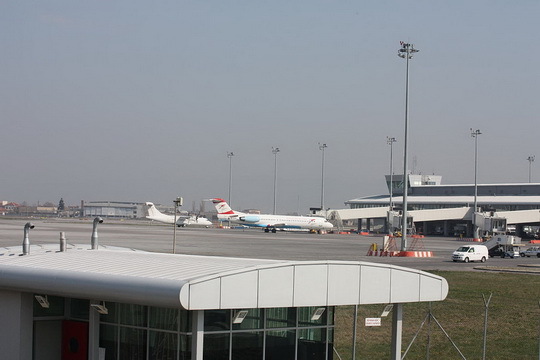 The airport is occasionally criticised as a source of environmental noise and pollution and strict noise abatement procedures have been enforced for departing traffic since the mid-1970s, while arriving traffic is generally routed to approach the field from the east, clear of Sofia. A significant and recurring operational criticism of Sofia Airport has concerned its historical lack of all-weather operations capability. Though the new runway was designed for ICAO Category 3 operations, in 2007 it emerged that radio interference from security fencing, and most significantly from a large newly built lorry park, prevented certification (and hence use) of the associated radio navigational aids. During the winter months, the airport, located on a high alluvial plain surrounded by mountains, suffers from very significant and frequent fog precipitation. 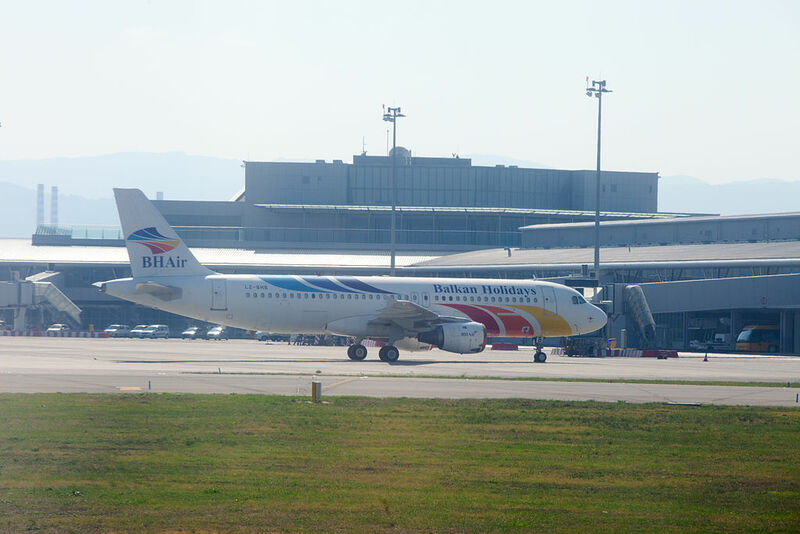 In such circumstances, flights are redirected to diversion airports in Bulgaria or neighbouring countries, lengthening journeys by many hours. On the north side of the airport is located 16th Transport Air Base of the Bulgarian Air Force, operating with: 3 Alenia C-27J Spartan, 1 Antonov An-2, 1 Antonov An-24, 2 Antonov An-26, 1Antonov An-30, 2 Let L-410 Turbolet and 1 Pilatus PC-12. 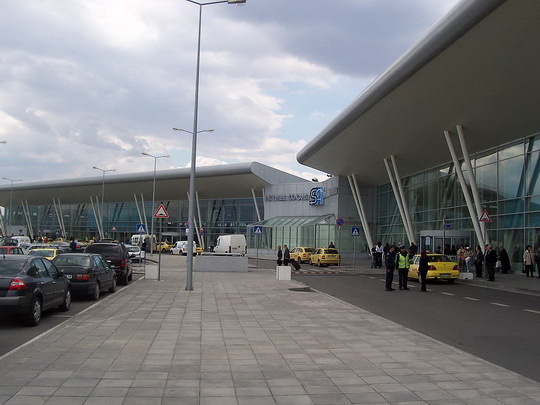 According to the plan a new Sofia airport terminal was built to the east of the old terminal and a second runway was constructed alongside the existing one. 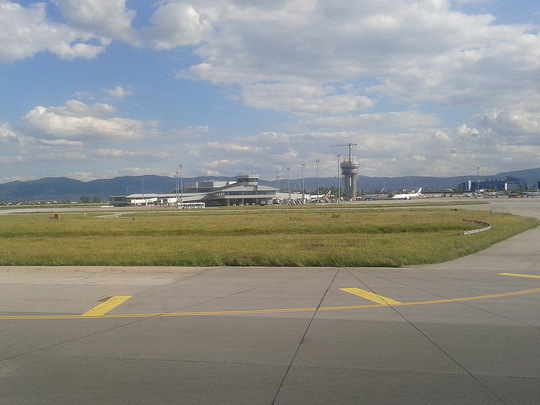 The old runway has been turned into a taxiway parallel to the newly constructed runway. Both cross the Iskar river. 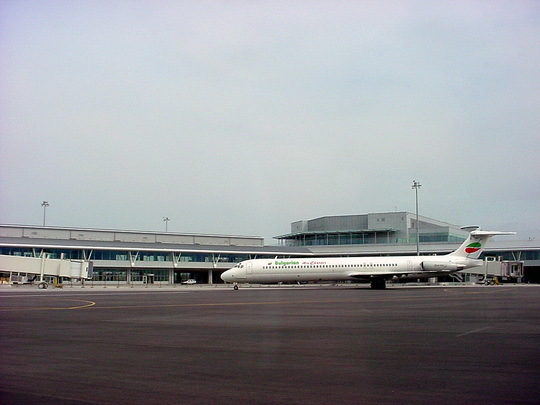 The new runway was opened in August 2006, while the new terminal opened in December 2006. Total cost of the project was planned at 200 million euros. Finance was secured in 1997-98 from the European Investment Bank (60 million euro),Kuwait Fund for Arab Economic Development (12.3 million Kuwaiti dinars, approximately 41.5 million euro), and the European Union PHAREProgramme (7.6 million euro). In August 2000 an ISPA grant of 50 million euro was allocated and in December the financing memorandum was signed. 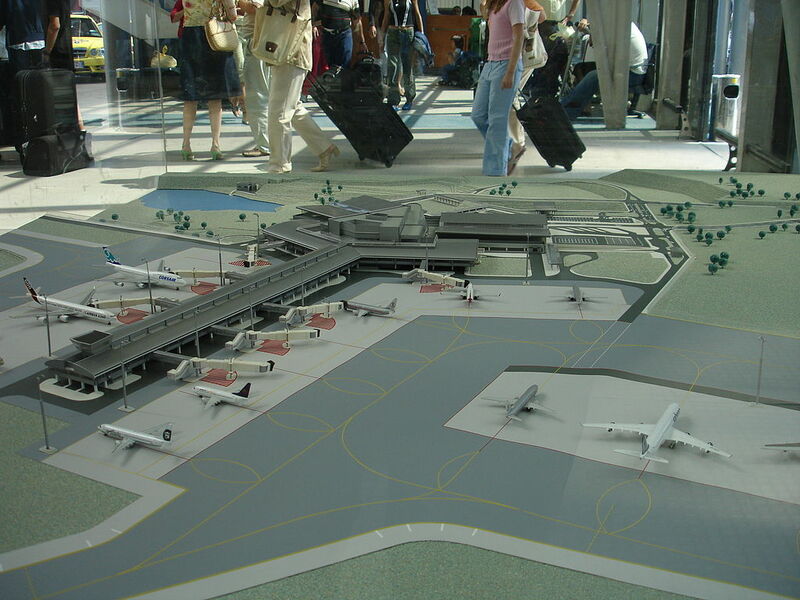 The construction works were in two lots: the new terminal with its surrounding infrastructure and the new runway. The first lot was allocated to the German branch of Austrian company Strabag, while the second was won by a consortium of Kuwaiti company Mohamed Abdulmohsin al-Kharafi & Sons and UAE-based Admak General Contracting Company. 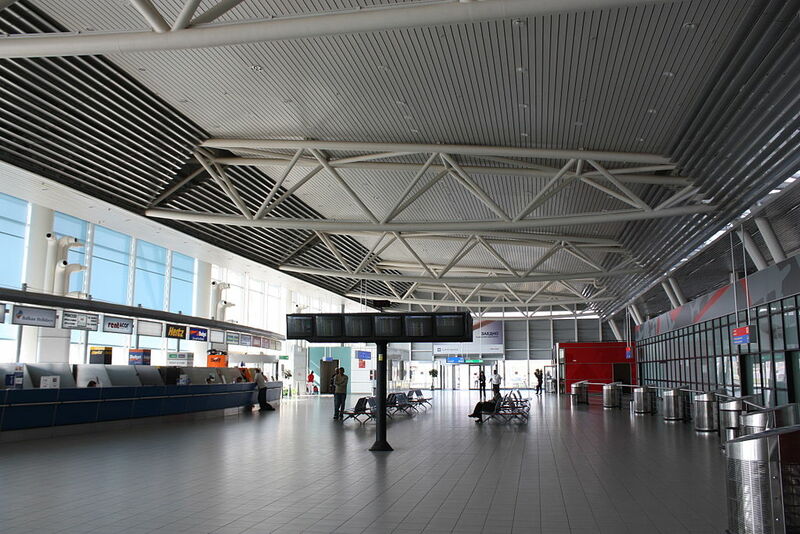 The initial completion deadline for the new terminal was 15 December 2004 to a total budget of 112.2 million euro. Immediately after work started, Strabag contested the geological surveys by Dutch consultants NACO B.V. and demanded additional funding for unexpected additional works. The delay was ten months, and construction resumed after the Bulgarian government agreed to augment the project’s value by 4.8 million euro and extend the deadline to 31 August 2005. In 2004 Strabag demanded an additional 6 million euro due to rising steel prices. The Ministry of Transportation rejected the claim, backed by a report from NACO. In May 2005 the contractor threatened to take the case to international arbitration. In August 2005, it became clear that Strabag would not be able to meet the changed deadline, slippage being put at six to eight weeks.In November 2005 Strabag asked for eight months’ further extension. On 31 August 2006, Sofia Airport put its new runway system into operation, replacing the old and out-of-date facilities. The new runway is offset at 210 m (690 ft) to the north of the old runway, with the eastern end of its 3,600 m (11,811 ft) long strip crossing over the Iskar river bed on a specially constructed bridge. New rapid and connecting taxiways are built additionally to open way for 200 aircraft movements per hour at a high level of safety. The navigational aids installed on the new runway enable landing operations under low visibility conditions at category IIIA of the ICAO standards. Two de-icing platforms are constructed to allow centralised de-icing procedures in winter. They are one element in the overall strategy of Sofia Airport for environmental protection and reduction of the harmful effects resulting from the airport operations. Lufthansa Technik Sofia was founded in late 2007 as a joint venture between Lufthansa Technik (80%) and the Bulgarian Aviation Group (20%). With the foundation of Lufthansa Technik Sofia, the Lufthansa Technik Group has created a fifth platform for the overhaul and maintenance of narrowbody aircraft in Europe. The Bulgarian facility serves customers in Europe, the Middle East and North Africa. The facility has undergone a major reconstruction and upgrading, with the target to be ready for the heaviest stage of aircraft maintenance checks, D-Check, that will be carried out in Bulgaria. Meanwhile the more than 350 staff trained in Bulgaria and at Lufthansa Technik facilities in Shannon Base Maintenance operations have started in the fourth quarter of 2008 with one Airbus A321 from Lufthansa as the first customer. On 19 August 2011 in the presence of Ivaylo Moskovski, minister of transport, information technology and communications, the BULATSA director general Diyan Dinev, Glavbolgarstroy AD chief executive director Pavel Kalistratov and Glavbolgarstroy AD executive director and management board member Nina Stoyanova signed the design execution and construction contract between BULATSA and Glavbolgarstroy AD for the new control tower at Sofia Airport (Sofia tower). Glavbolgarstroy AD were selected as contractor, as they were awarded the highest technical rating during the public procurement procedure having proposed the shortest construction timeframe. The quoted price amounts to BGN 14,813,030 inclusive of VAT and according to the contractor’s building works schedule the new Sofia tower will be built in less than 10 months. This project is being financed entirely by BULATSA. Sofia Airport - The new Air Traffic Control Tower. 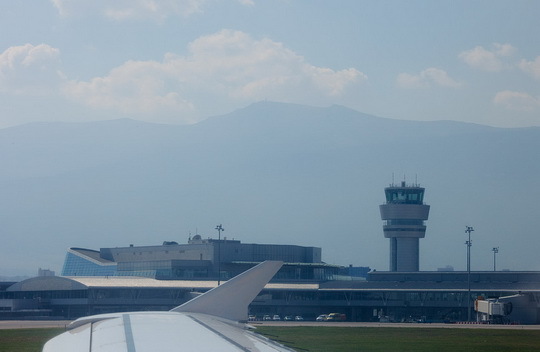 The construction of the new Sofia tower is related to the reconstruction and development of Sofia Airport and is the natural extension of the development of the airport complex. The new control tower will allow BULATSA to ensure enhanced quality and efficiency of air navigation services (ANS) in the terminal area. The new Sofia tower will be situated to the west of Terminal 2 and will be complementing the terminal building in architectural terms. The total built-up area of the tower will be 2,400 m2(26,000 sq ft) and its height will be 50 m (160 ft). A lot of consideration has been given to the design of the layout, the functional definition of the working positions, the operations room surface area for ANS provision and meteorological observation, as well as to the requirements for visibility to the runway and the approaches and access to an open observation platform. An analysis was conducted to facilitate the definition of the necessary equipment for the air traffic controllers’ working positions and the deployment of working positions in the control room of the new tower. In 2007 a council of experts was tasked to develop the project’s technical assignment and prepare the documentation for a competition programme in order to acquire a conceptual design for the construction of a new airport control tower and its adjacent infrastructure. A preliminary road-map for project execution was developed and a permission was obtained from the Bulgarian Civil Aviation Administration (CAA) for the height of the future tower � up to 55 metres (180 ft). A competition programme for a conceptual design was drafted and coordinated with the CAA, the Bulgarian Chamber of Architects, the Bulgarian Architects’ Union and the Chamber of Engineers Involved in Investment Design. An open public procedure for a conceptual design for the construction of the new tower and its adjacent infrastructure was held in 2008; a contract was signed with Architectonika Studio OOD for the elaboration of a conceptual investment project. During the same year a contract was signed with Mix Consult OOD who would act as a consultant in the meaning of Article 166 of the Law of the Administrative Territorial Structure of the Republic of Bulgaria during the process of design and construction of the tower. In 2009 a contract was concluded with Architectonika Studio OOD for the elaboration of a technical investment project as well as a contract with AT Engineering 2000 OOD, Sofia, for the construction of a fence and the separation of the construction site from the security area of Sofia Airport. On 6 January 2010 the Ministry of Regional Development and Public Works of the Republic of Bulgaria issued building permit No. 3/06.01.2010 for the construction of the new airport control tower and its adjacent infrastructure. 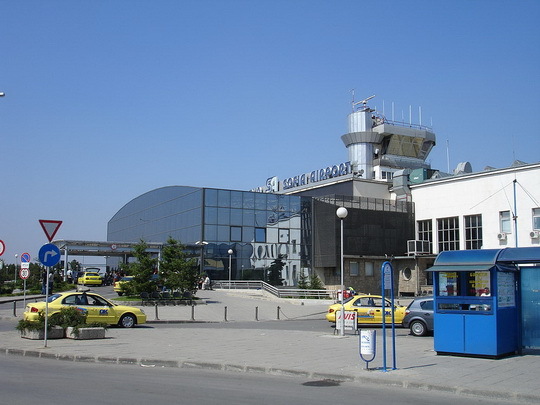 The selection procedure for a contractor of the design execution and construction of the new tower at Sofia Airport was completed on 19 July 2011. In mid-2012 the airport will have one of the most modern and most beautiful airport towers in Europe. This boasts the head of state enterprise “Traffic” (ATSA) Dian Dinev, who signed with the director of Glavbolgarstroy Pavel Kalistratov a contract for the design and construction of the facility, which will cost over 14.8 million. The new tower is an extremely important facility for both ATC and the airport because it is related to the safety and security of flights, explained by the transport department. “It seems to me lies to try to speed things slowed down,” boasted Minister Ivaylo Moscov, who attended the event. The idea of creating her since 2006, but still not realized. The location of the new airport control tower is west of the building of Terminal 2 at Sofia airport, from an architectural point of view the two buildings complement each other. The total building area is over 2,400 m2(26,000 sq ft) and the height of the building will be 50 m (160 ft). Service life of the new airport control tower will be more than 40 years and is designed to serve the airport with a possible extension. The manager will have full visibility over the airport, to guide aircraft landing and taking off. Glass tower will have a maximum UV protection. Hall does it is completely soundproofed. A record will be the deadline for building the new facility � just 10 months. The need to build a new control tower is connected with the reconstruction and expansion of the airport and is a natural development of the airport complex, reported from the transport department. Contract for detailed design and construction of a new control tower of the airport and forming an ATM Glavbolgarstroy. The tower will be 50 meters high and will be built near Terminal 2, as both architectural buildings will be complementary. The new tower was officially opened on December 7, 2012. 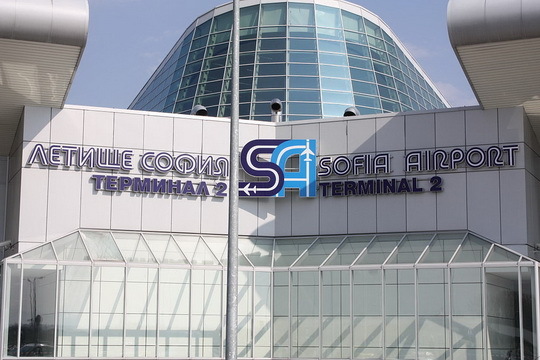 This terminal, which is well known to the inbound/outbound passengers in Sofia, now has a new name: Terminal 1. It was built in the first half of the 20th century and opened on 16 September 1937. It has been extended and improved many times, fundamentally renovated in 2000, still making, though, curious allusions to the latest history of the continent. Terminal 1 offers easy access, simple procedures and efficient services up to the modern airport standard. 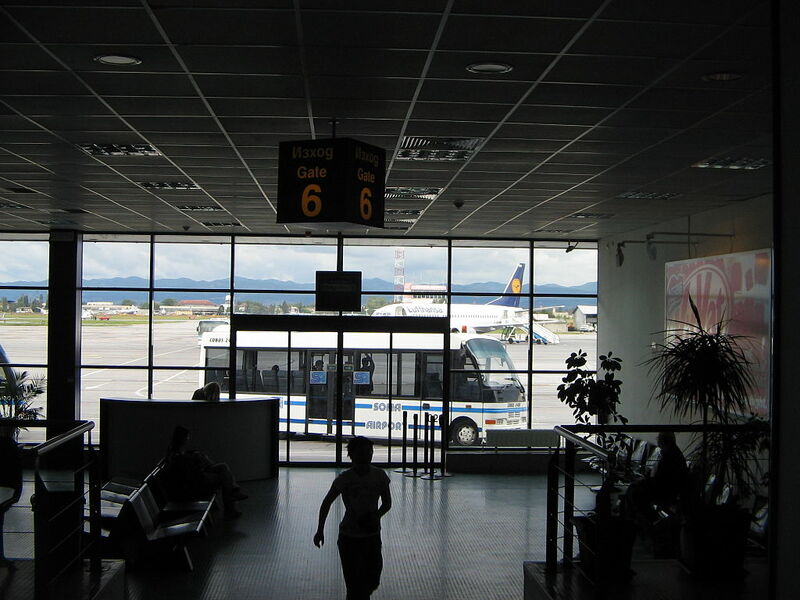 Terminal 1 currently serves low-cost and charter carriers. 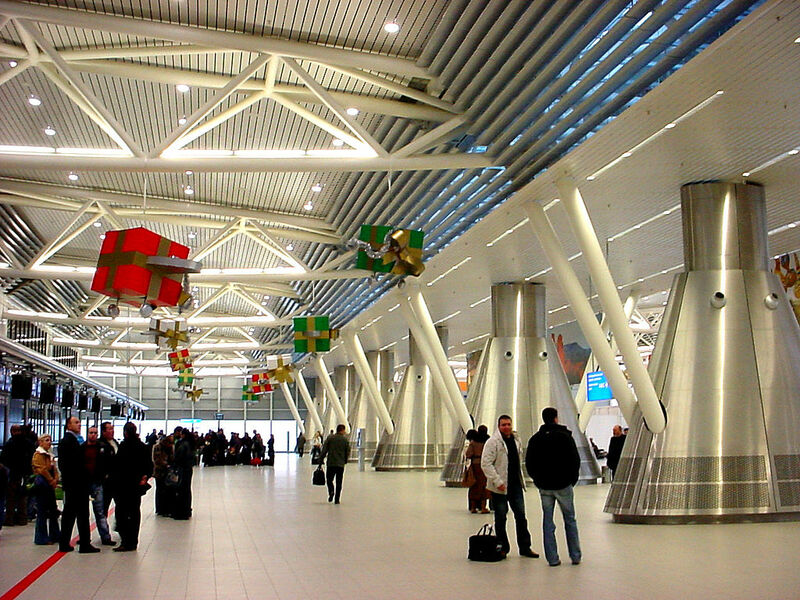 Terminal 2 was officially opened on 27 December 2006 with the symbolic arrival of Bulgaria Air flight FB 408 from Brussels. It was one of the biggest projects in Bulgaria to receive funds from the EU ISPA programme. 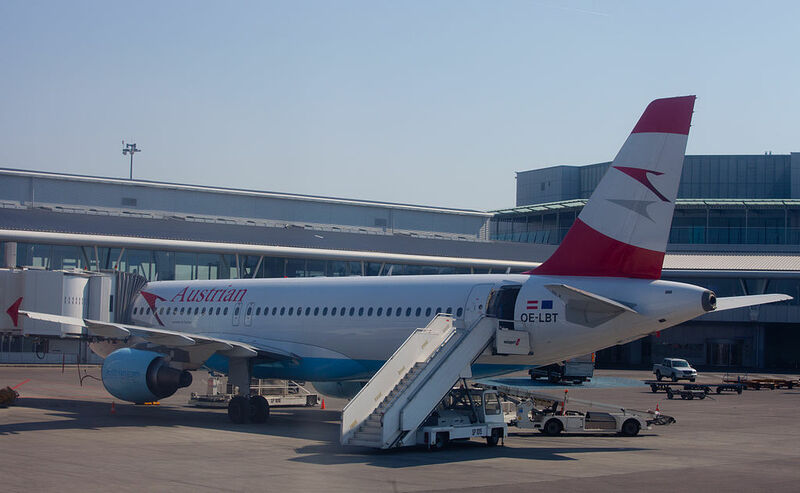 The price includes the new terminal, new aircraft parking aprons, upgrading the existing aircraft parking aprons and the construction of connecting taxiways. The terminal has seven air-bridges (gates A1, B5�9 and C1), 38 check-in desks and covers an area of 50,000 m2 (540,000 sq ft) and has a car park for 820 vehicles. It is located to the east of Terminal 1 and is significantly bigger than the old one which continues to serve low-cost and charter airlines. The passenger terminal building is designed with a capacity of 2,000 peak hour passengers or up to 2.6 million passengers a year, plus 26,000 tonnes of luggage. 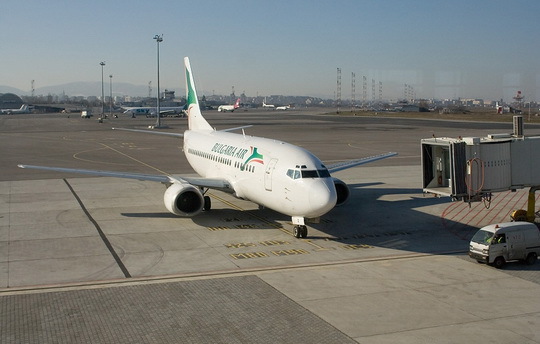 For the first time in Bulgaria, a terminal has airbridge-equipped gates instead of relying on airside busses. The Sofia Airport Centre, a premiere corporate office, hospitality and logistics centre in Bulgaria is being constructed in the vicinity. The infrastructure surrounding the building was expected to be completed in 2007. It includes a new dual carriageway road connecting the terminal to the existing airport road, and landscaping including an artificial lake and a fountain.The airlines ticketing offices, tourist and car hire desks, banks, post office, and cafeterias in Terminal 2 are located in the public area. The travel retail shops, Bulgarian wine and spirits shop and Business lounges are located airside beyond the area of border control. Terminal 2 is designed with special attention to disabled passengers. Their access to the different terminal levels and the multi-storey car park is facilitated via lifts and escalators. Sofia Airport - Bulgaria Air Boeing 737-300 arrives from Brussels at Terminal 2. The VIP terminal is located in the western wing of Terminal 1 and has an entrance of its own, providing an access to four separate rooms � one main room and two separated rooms with about 20 seats each. Guest also have at their disposal a TV, Wi-Fi and cable internet connection, Bulgarian and international press, periodicals, as well as different types of refreshing non-alcoholic and alcoholic drinks and food. The Government terminal is located in the western side of Sofia Airport. 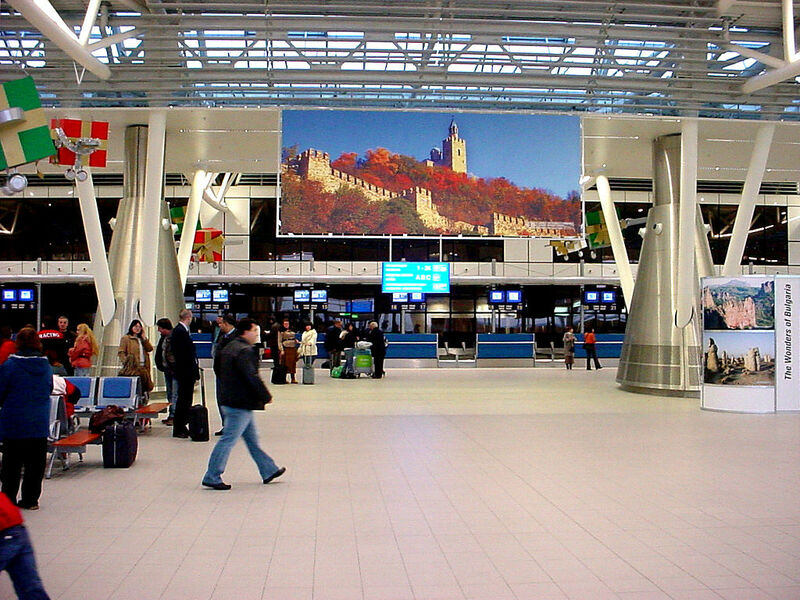 The terminal is often used by foreign heads of state visiting Bulgaria. The terminal is operated by the 28th Air Detachmentwhich operates government aircraft and operations involving the President, Prime Minister and other high-ranking government officials. Sofia Airport - Austrian Airlines Airbus A320 ground handling at Sofia Airport. Sofia Airport - easyJet Airbus A319 at Sofia Airport. Sofia Airport - BH Air Airbus A320 taxing at Sofia Airport. 14. Dortmund Wizz Air ? Two bus routes (No 84 and 384) connect the airport. Line 84 goes to the Sofia University and connects the airport with the city centre. Line 384 which connects the airport with the Mladost 1 Metro Station and Mladost district. (working hours 5:00-23:00 every 20�30 minutes). Taxis are available at the landside of the arrivals areas of Terminals 1 and 2. OK Supertrans is the official taxi provider to Sofia airport. Taxi ride to the city centre usually costs 5-7 Euros (10 to 15leva). Fraudsters, posing as legitimate taxi drivers in the lobby often demand 50 Euro or more for a ride into town. The official price must be displayed on the window of each cab � it is (as of January 2013) 0.79/0.90 Leva per kilometer (day/night). 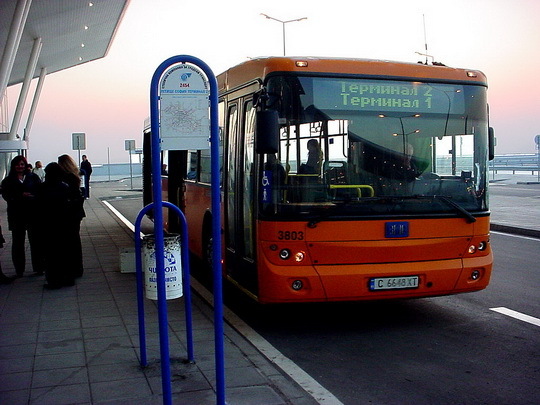 An extension of the Sofia Metro Line 1 is planned to reach the airport in 2015. Construction began in September 2012. Brussels Boulevard is the main thoroughfare and the easiest way to reach Sofia Airport. Via Brussels Boulevard and Tsarigradsko shose, Sofia Airport is connected westwards to the city centre and eastwards to Trakya highway. From the northern city areas, Sofia Airport is conveniently accessible via the East Tangent Str. Its junction with Botevgradsko Shose opens an exit intoHemus highway. An outdoor parking lot servicing Terminal 1 is located in front of the terminal building, with a capacity of 400 vehicles. 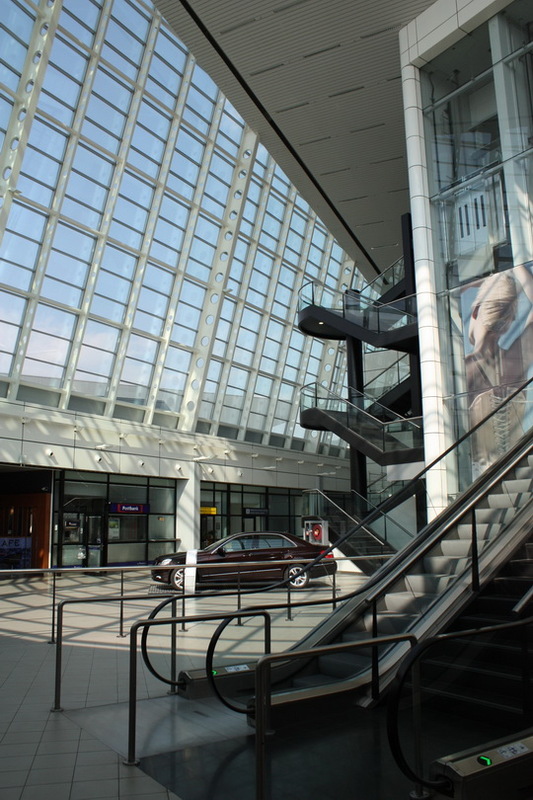 Terminal 2 provides paid underground parking to visitors and travelers. A passageway connects the main terminal building to the parking lot with a capacity of 800 vehicles. Major car rental companies have offices on Sofia Airport. 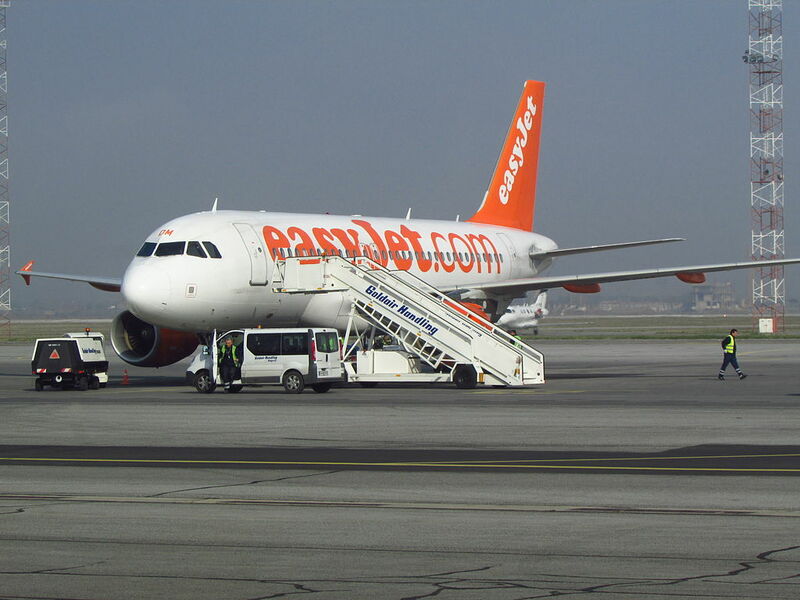 Terminal 1: Choice Rent a Car, Europcar, Sixt, Thrifty Car Rental. Terminal 2: Avis Rent a Car, Budget Rent a Car, Choice Rent a Car, Europcar, Hertz, National Car Rental, Thrifty Car Rental, Moto-Pfohe Rent a Car. Sofia Airport provides a courtesy shuttle between Terminal 1 and Terminal 2 every 30 minutes between 07:00 hrs and 18:00 hrs. Intra-terminal transportation between 18:00 hrs. and 23:00 hrs. can be requested at the Information desks inside the public areas of both terminals. On December 22, 1971, a Balkan Airlines Il-18 crashed en route to Algeria. 28 people on board died. On November 22, 1975, a Balkan Bulgarian airlines An-24 crashed short of the runway after take-off in icy conditions. Of the 48 people on board, three were killed. On 10 January 1984, a Balkan Bulgarian Airlines Tupolev Tu-134 crashed on approach in bad weather. All 50 people on board died. On 2 August 1988, a Balkan Airlines Yak-40 crashed in the Iskar river. There were 28 fatalities among the 37 passengers on board. On 17 May 2012, an OLT Express Airbus A320 flight YAP-7107 from Warsaw (Poland) to Hurghada (Egypt) with 152 people on board performed an emergency landing. During the descent, the crew reported a fire in the cabin and loss of pressure. The aircraft landed safely and was evacuated via slides. No injuries occurred. The airport was closed to traffic for one hour.